There is a classic pamphlet in Christian literature called, “The Tyranny of the Urgent.” It discusses how urgent, deadline-driven tasks divert Christians from their devotion to God. On a smaller scale, I see the same thing happening in my writing. Deadlines rob me of my writing time. I’m speaking at such-and-such a conference, so I must finish my powerpoint presentation. I must complete the handouts. I’m doing a school visit next week, so I have to stop and make sure everything is in order for book sales. I’m writing a magazine article and the editor wants revisions by noon tomorrow. If all we did was write, we could write all the time. But if we want publication, then it comes with a host of urgent deadlines. Our job is to carve out the time to write in spite of this. Don’t let the Urgent be a Tyrant that makes you forget the Important. I was particularly struck by that passage myself, Darcy. 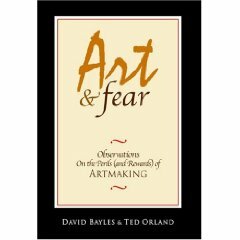 I loved, loved, loved, Art & Fear. Yesterday I only eked out about 300 words of my WIP because of all the other business-related stuff. Good luck with your novel!